Happy Friday everyone! I hope you've all had a great week and are ready for some Friday fun! 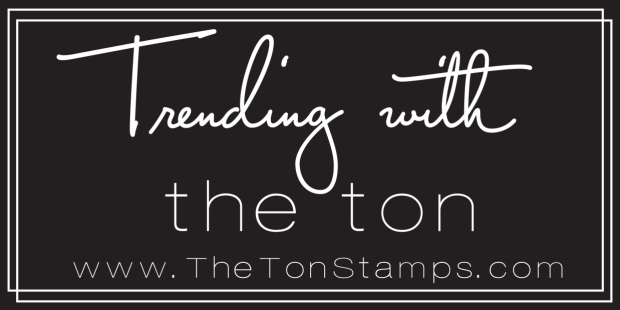 Today, I am thrilled to be guest designing again for The Ton Stamps' Release Blog Hop. Once again, Effie has knocked it out for the park with her new spring release. 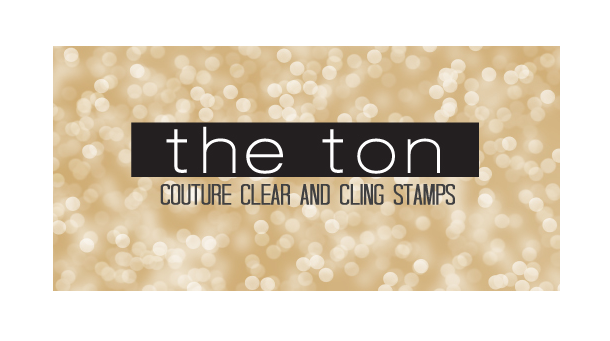 In case you haven't seen already, The Ton has 18 new stamps for their new Spring 2017 Release which includes up to three free gifts with purchases. For more information on The Ton’s incentive gifts, head over to The Ton's blog. All new release products are available now! For today's blog hop, I chose to work with Zig Clean Color watercolor markers for both of my cards. My first card used the perfume bottle from Marvelous Perfumes along with the single bloom from Wishful Wildflowers. This particular bottle happens to be a personal favorite of mine. I have a few of these shaped bottles in my possession, and wear the perfume contained inside everyday! I stamped the bloom and the bottle with Crystal Pewter ink. I didn't bother masking either of the images, as I knew the pale gray would disappear under my coloring. I used my Zig markers and a paintbrush to color them. I drew in the final details of the bow, and spray top with a Copic Multiliner, and added the white highlights to the flower center with Copic Opaque White. I cut my watercolor panel to a 4 1/4" square using the Double Stitched Square Die. I adhered my panel to a layered 5" cardbase. My sentiment is added last with Caviar Hybrid ink. My next card is also watercolored with Zig markers. I've always loved Effie's florals, and these new sunflowers in Sunflower Bouquet prove no exception. This bouquet is lovely, big and gorgeous, and is the perfect image to add little or lots of details! 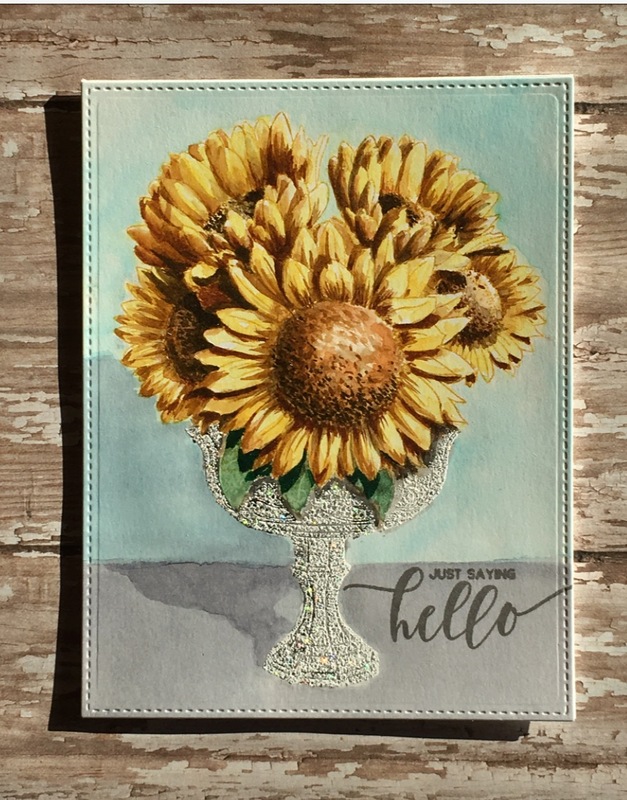 To create this Sunflower Bouquet card, this time I did some masking. I carefully stamped the bouquet, without inking the stems, onto my watercolor panel using Frosted Vanilla Cupcake ink. I stamped it again on Post-It tape and cut a mask for the lower portion of the bouquet and leaves. I used that Post-It mask to cover the bottom of my image, and stamped the elegant vase from Fresh Cut Roses in Versamark so that the flowers would appear hanging over the edge of the vase. I sprinkled Wow! Diamond White embossing powder over my Versamark ink and carefully removed the Post-It mask before heating with my heat gun. Make sure you do that or the adhesive from the Post-it when heated can make a mess. I love that embossing powder. Look how pretty it is with all the intricate details of that vase stamp! Depending on the light, that powder makes it can look either like a fine crystal or elegant silver vase! Once my heat embossing had cooled, I painted my background and shadow before painting the flowers. I prefer to use my Zig markers not as actual markers, but as small convenient vehicles to deliver paint to my palette. I've always preferred to paint with a brush, picking up the color from my palette. I feel I have much more control with my brush. Since this ended up to be a large image, when it was completly dry I used the full A2 sized Double Stitched Rectangle Die to trim my watercolor panel. I added the hello sentiment in Light Onyx ink before adhering to my card base. That's it for my projects today. Thanks for visiting me and hopping with all of us today. I hope you have reached me from Lisa Harrolle' s blog. 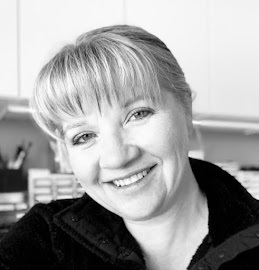 Your next stop on the hop should be Miriam Prantner. But before you wander off, check out these fun details! As with previous The Ton Stamps blog hops, there are PRIZES!! Five $25 gift certificates to The Ton's shop will be given away to random commenters from the hop participant blogs. To qualify, you must leave a comment on The Ton Stamps' Blog Hop post. The comment period will close on Monday, April 10th at 11:59pm. Winners will be announced thereafter on The Ton’s blog. Have a wonderful weekend, and happy hopping! Your coloring is AMAZING. Love both of your cards! I love these cards, so beautiful! Your cards are so stunning! I love the watercolor look on your cards. Very beautiful. Beautiful cards! Your coloring is really beautiful! These are just beautiful! I love your unique style! OMGosh your coloring is amazing! Your cards are stunning! Your cards are amazing!! I love the vintage feel to them especially the sunflowers. Very unique. Both cards are amazing but that sunflower one is just phenomenal!! Fantastic coloring. I love the shadow behind the sunflower vase! WOW!! You are truly talented! Those sunflowers look so really I wanted to reach out and touch them. Amazing!! WOW! 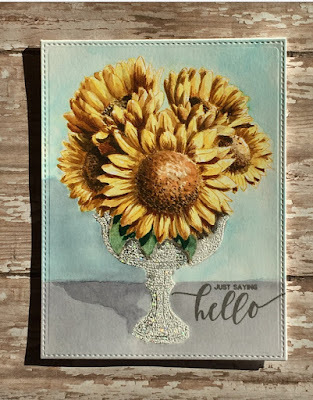 Love your cards and the sunflower is so realistic and gorgeous. SO amazing! absolutely amazing coloring, as usual. These are beautiful cards - or framable! Beautiful cards Chris!! The sunflower card is stunning! Your coloring, for lack of a better word, is just wow!!! I love that vase you have added. I would love to own these stamps , they always look so elegant 😃 . Wonderful job ! 😍😍😍😍 They look so real ! The sunflower bouquet looks so lush! Beautiful! OMGosh!! Your water coloring is AMAZING! These cards are gorgeous! Love that perfume bottle card. Love what you have done with these sunflowers and the vase is incredible! Amazing watercoloring on these gorgeous cards! Beautiful cards. Your coloring is awesome. Love the way you did that second one! Sooooo pretty!! Your cards are amazing...That second one is swoon worthy! Stunning cards and vivid colors. Beautiful cards using the Zig pens for watercoloring! OH WOW!!! These are absolutely stunning!! Your coloring is amazing ad it gives a gorgeous water colored look! Great colouring in these cards...they look wonderful! Wow! your water colouring is beyond amazing! Gorgeous coloring on these beautiful cards! Love the perfume bottle and the sunflower stamps! Oh my amazing work with the zigs! Your watercoloring is absolutely stunning! Oh my, these are stunning, both of them - absolutely love the scenes you created, and your colouring,,, ooooh! Your cards are fabulous. Lovely coloring. WoW! They're both fabulous - with terrific shadows, too! I especially love those gorgeous sunflowers! Such amazing cards and your coloring is brilliant! Beautifully done. Elegant in its simplicity. Wonderful. Your colouring have something special like your cards so much. Beautiful! your coloring is fantastic! Gorgeous cards! Your coloring is stunning! I don't have the words to tell you how much I love your cards. OMG! Absolutely Gorgeous!!! Your watercoloring abilities are amazing! I love the one with the sunflowers the most! Your sunflowers are amazing! And The shadows are so deep! Great job! Love the sunflower card. The vase looks like cut crystal. Beautiful! Your color palette is phenomenal! I LOVE the look of the linen matte on your perfume bottle card! Your coloring is so striking. The glass perfume bottle and the vase look real enough to touch, and your sunflowers are amazing! Your artwork is amazing and beautiful. Thank you for sharing. I can't believe the dimension you were able to achieve on your sunflower card! The coloring is perfect! I love this new sunflower stamp set! 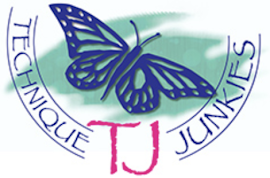 Thank you so much for sharing both of these beautiful projects and the wonderful inspiration! Such beautiful cards, Chris! Thanks for sharing these beauties. Cute vintage-looking cards. Thanks for sharing and for a chance to win!